This games day we'll be playing 2,000 points. No restrictions on missions. Övriga arrangemang / Armagedons Tärningsbeställning! Söndagen den 8/4 kommer föreningen Armagedon ha påskträff. Ta med familjen och prova på olika brädspel eller rollspel. Testa figurspel som till exempel warhammer eller titta på andra spännande saker som finns i våra lokaler. Vi håller dörrarna öppna för allmänheten 13.00-21.00 och det är helt gratis att komma hit och prova på våra aktiviteter. This months games day we will be playing 2,000 points and using the ITC missions and rules. We plan on testing out the ITC rules so we can run a friendly tournament and everyone is a bit more comfortable with how it works. Next games day is 10th Feburary starting around 10:00. 1750 points with random missions. We also have starter games for people who want to play test. Next games day is 13th January starting around 10:00. Next games day is 9th December starting around 10:00. We now have a facebook page also. 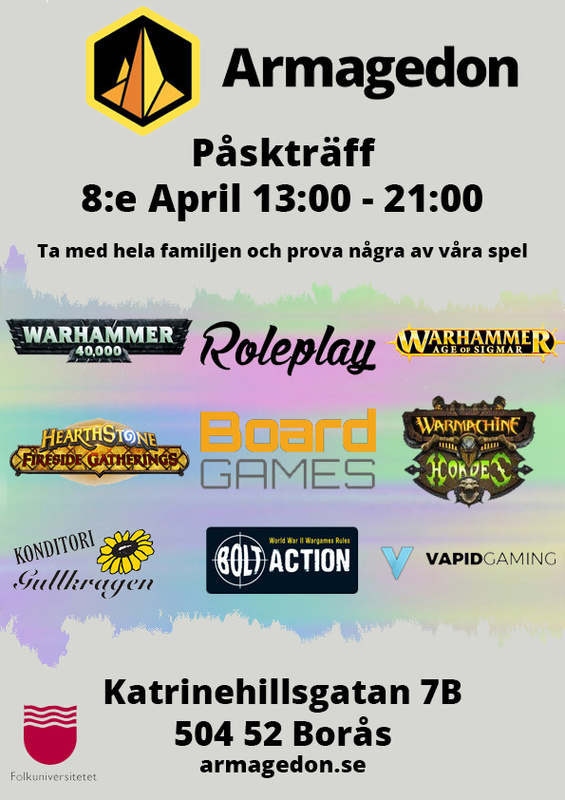 Set up another 40k games day for the 22nd of October starting at 10:00. Playing 2000 point games, with random missions. We have spare armies, so we can run a tester game if people want to try it out. Set up another 40k games day for the 16th of September starting at 10:00. Playing 1750 point games, with random missions.